Tis the Season for prepping for 2014 Primary! The principles taught in Primary are so powerful. I’m grateful that this is what my children are learning. Heavenly Father has a plan for each of them. He knows they can succeed as they keep His commandments. I Love it! ~ as much as I’d love to create all the other primary goodies to accompany these, I can’t promise that I’ll have time. After all… My Family is Forever and thus I need to focus on them as #1. Thanks for understanding. Cute, clean & colorful design! Thank you for sharing your talents! 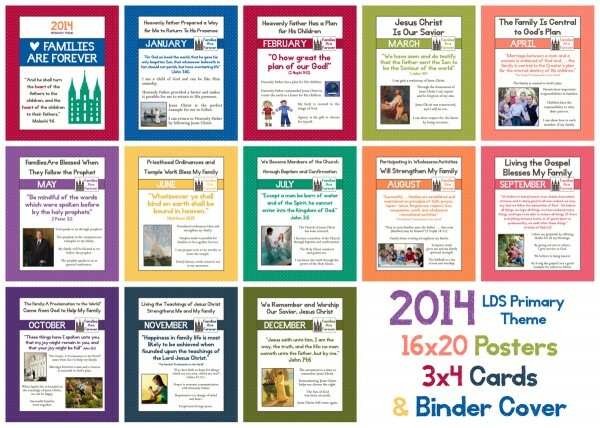 I would love a binder cover with a calendar…exactly like you did for 2013 theme?! It was the most useful and cutest I’ve found! Thank you so much for the 2014 posters! These are simply the best! I appreciate the time you have spent in the service of others (including me!) by creating such beautiful things for our Primary children and our families! Another beautiful creation! Thanks so much for sharing! Any chance we could get these in 4×6? I wanted to do a little 4×6 photo book for my kids. I know you are busy, so if that’s too much time and you can’t, that’s fine. Just thought I’d check. I used your printables last year and they cheered our primary room up! Thank you! I’m so happy you did them again and I love the new colour palette! Thanks again for sharing your talents. I so love the idea of 3×4 cards on a ring. I downloaded the file but can’t get cards 2 and 7 to extract. Any ideas? Hey, I can’t get the yearly theme to download in a pdf…anyone have any ideas? Is says that it was damaged or downloaded wrong. I tried it several times. Hi I have tried to download these but it will not open in PDF, it keeps saying that there was some kind of error. They are beautiful and would love them to cheer up our primary room here in New Zealand! I loved using your monthly theme posters in our class room last year. I tried to download 2014 monthly theme posters and kept receiving an error. Do you have any suggestions as to the best way to print these? Love these! Printed at Walmart and they won’t let me have them without a copyright release form. Can I get one? I love these! I would love an editable version of the binder cover, if possible. The colors of the text are not printing well for me and I would like to try to darken them. I have PSE if you have a file in that format. Thank you so much! These will be wonderful for our bulletin board in the hallway. I love that it states simple truths for passers-by to see and reflect on. Hi .. these are lovely but I am having problems opening it in PDF .. keeps coming up as Acrobat. Can anyone help please? I love the primary monthly theme pages! I tried downloading them but when I try to open the document (jpg) It says the document has been corrupted or something has happened to the document. Has this happened to anyone? Or is it just my computer? Thank you so much for your efforts and for sharing your talents! Our primary boards will be filled with many of these designs! Thanks so much for doing these. We plan to use them as part of an invitation postcard for children who we are missing at church. It’s a perfect way to give them a little taste of primary even if they don’t accept the invitation. I can’t seem to get these to print. Would you know why that is? I noticed a few comments about not being able to print. I had the same problem but FINALLY figured it out lol. When you download the file it is in a “zip folder” and the folder needs to be “unzipped/extracted” in order to be able to print. Here’s what I did on my computer and was able to print. Hopefully this will work for you too. 1) Download the file from the website. (I chose to save my document to the desktop so I could find it easier but you can save it anywhere you want). 2) Right click on the folder you have just downloaded. 4) After it has unzipped/extracted you should be able to open each file/picture separately and it will now give you the option to print. Hope that helps and PS I <3 these beautiful posters! Thanks for sharing your talent and hard work.